Today the church celebrates the Feast of St. Mary the Virgin. There is quite a bit of celebrating to do, because Mary and her witness are extraordinary. I love the ancient title for Mary, Theotokos. It can be translated Mother of God, which is a somewhat startling way to speak of Mary. Sometimes people prefer to call Mary the God-bearer, another translation of Theotokos that is evocative. Either way, when we think of Mary we must also think of her relationship to Jesus Christ, the one she boldly and courageously brought into the world, the one she taught and loved and eventually mourned. 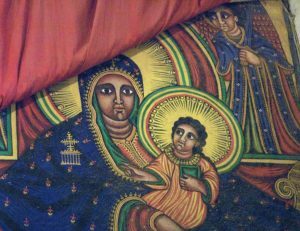 St. Mary of Zion, Axum, Ethiopia. But it would be a grave error to make the mistake of thinking of Mary as a mere vessel. Too many people over too many centuries have made that mistake. If you want evidence of Mary’s strength and faith, look no further than her song, the Magnificat. We would do well to follow Mary’s lead. We are not called to bear him into the world as she was, but we are called to proclaim and to celebrate Jesus Christ as she did. We are called to remind the powerless and the poor that they are dear to God. Let us today celebrate Mary’s strength, Mary’s faith, Mary’s courage, and Mary’s sense of God’s mercy and justice. 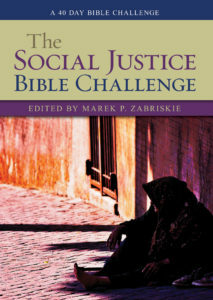 Featuring forty days of reflections by spiritual leaders and writers from around the world, The Social Justice Bible Challenge is an extension of The Bible Challenge, a global initiative to encourage daily engagement with scripture and an exploration of the Word of God. Disciples wishing to spend more time engaging the Bible on topics from poverty, hunger, displacement, and the care of widows and orphans will have their cups filled over and over again by the words of Scripture and meditations from people across the Church who engage with these realities each and every day.